I‘m back to my usual kind of blog after experimenting a little over the last few posts; was my venturing past my boundaries successful? The jury isn’t in yet but I think if I sprinkle a little bit of this and that in my work and not do so much of the same old same that it could be beneficial to me and my creativity. Pose Fair has really been helping me out with that as well giving me the ability to do all different kinds of photos (singles and couples, and before the round is over maybe even friend or group ones). HCXII has been on my list of pose stores to blog for a while now and I wasn’t able to swing anything from the October ’18 round of Pose Fair but I made darn sure that I wasn’t losing that opportunity this time. They’ve released a series called Hellgrind and there is a set for males, females, and a male friends set all with guitar props. The set I am using is the Hellgrind “Haedulus” which includes 2 different versions of the guitar that when poses the users avatar when worn. There are 6 different poses to choose from so that rocking out in a photo never seemed sweeter. 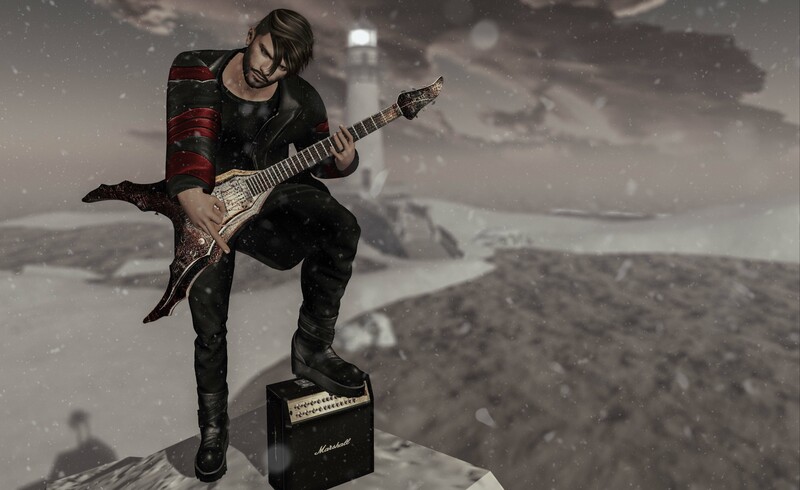 This pose combine with the arctic type background gave me the opportunity to crank up some Black Sabbath and use “Snowblind” as this blog posts theme. I also wanted to make it look like one of those old school 80’s or 90’s videos where the lead guitarist is in some remote location just grinding away on his axe like it wasn’t out of place. That’s my bit of nostalgia for the time being and it was pretty fun getting this together in little to no time flat. One of the cool things being a blogger for different brands is that I get introduced to new events that one of the stores I blog for is participating in; the most recent of which is Salon 52. This is an event strictly for hair stores and while most of what I have seen so far has been geared towards women I feel that in time the amount of male items involved will increase (hopefully that is). Modulus is one of the stores involved in this event and gladly for me is that most of their production is being the stylist to the fellas on the grid, myself included. The hair that they have at Salon 52 is something I thought definitely works for the rockstar vision I had for my look; the “Tony Hair” which is a medium length flowing hair does the job. It helps me give the appearance that I’m shredding away in a snow laced middle of the arctic where it is fairly windy; my hair blowing around. This is a prime example of what I was writing about as it pertains to Modulus hair, it’s not just a flat boring hairs and gives the appearance of moving (such as the wind blown look). Besides the pose and hair, the only other item that I haven’t previously blogged is the jacket I have on from a store named Kio. I was going through the items list from The Saturday Sale and it interested me enough to take a closer look. The store itself is pretty new as there were only a few items there but I figure it will expand more as new things are made; after testing and making sure it fit I quickly snapped it up. I returned to the platform where I place down backdrops and get dressed for blogs more often then not and this may be considered a lazy tactic but I like how the Gabriel pants and boots from the motorcycle blog I did with Brenna looked so I put those on and called it good. I wanted to my friend Lucky’s place (which is in the arctic) and began working. This post came together rather quickly which was nice because I have been tired the last couple days from RL stuff. Anytime I can take a photograph and get it ready and write so that it is ready to post the next morning is a blessing and helps to keep the workflow steady like a stream (much like the near frozen lakes behind me in the photo). On that note I am going to close this up and leave the credits behind. Plenty more to do but for now I am going to set this to post in the morning so I can get a fresh start and share it with the social medias while most of the world is still conscious. Keep the conversations going and I shall catch everyone again real soon! It’s a good thing you shot it when you did cause my place is no longer arctic lmao. Good post bro, keep em coming.